Like many of you, I would like to have a bit more information on Cartel Coins and how Free-to-Play will work. 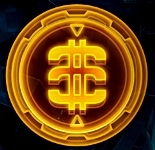 I would have even loved to have them tease an item available for purchase on the Cartel Market. Now that said, I am happy to hear about any new information from BioWare. I also found a few interesting little facts that they gave us on the features page. These refer to what unlocks for players, when a purchase is made on the Cartel Market. Look below and see what you think. The ability to run faster (Sprint) starting at Level 1. Cargo Hold access (Bank Slots) and higher login queue priority. Increased access to Chat and Secure Trading. NOTE: Characters must be at least Level six (6) to unlock access to their ship’s Cargo Hold, full General Chat, and Secure Trading. I like the thinking behind this idea. It gives some incentive to make a purchase. However, I don’t like them taking the Sprint ability away, even if they are using the Free-to-Play option. This was such a positive when they gave it to the community and now they yank it away, because a player is utilizing their new option of Free-to-Play. The added bank slots/cargo hold storage, adding more access to chat and more trading are great incentives. Let’s all play developer and see what we would make an incentive instead of Sprint. What are some of your ideas? Please let us know in the comment section below. By now this is no big secret about the addition of Patch 1.5 content to the Public Test Server, which includes the quest for obtaining a new companion, HK-51. This is great news that they are getting this to the PTS soon, for one it gives more time to iron-out bugs and unforeseen glitches with addition to new systems and content. Secondly, it shows to me that BioWare is really working to keep new content coming. This has been one of the things the community has been wanting, more content and sooner. Now a couple of issues for me, I remember from Gamescom that the new Warzone, the Ancient Hypergates was going to be added right after Terror From Beyond. I believe, in Geldarion’s article he also makes reference to no mention of this Warzone. Now I understand that in the gaming industry things change and issues arise, but if there is a reason for not including it in Patch 1.5 content, please communicate that with your community BioWare. You can avoid a lot of “hate” threads by just being upfront with the players. Yes, we gamers will still whine and sob, but if there is a real reason as to why for not including it, more of us will understand and not even think twice about it. The other issue I have has to do with the obtaining HK-51. Honestly, I have not read any of the guides, yes there are already guides for obtaining HK-51. My issue is not exactly with the guides, but the fact the new companion was obtained in less than 24 hours!!! This was built-up to be a huge arcing story quest. It even received one of those high-priced Blur Studios trailers. I am not talking making the quest so difficult or so lengthy people just give up on it, but it should take around a week or two to obtain him. Considering once you obtain him, he will more or less be a companion for dallies or a new crafter. The companion is not Legacy bound either, so he will remain primarily on my ship until level cap is raised. What are your opinions on the new content on the PTS? Those who have completed the HK-51, please let know your opinion on the quest without too many spoilers, in the comment section below. In an earlier HoloNet Links article, seems like awhile ago, I wrote about fan fiction contests that were going on in the official SWTOR forums. Looks like they are still going on! These are a bit different, but the writing is really creative and good. The way they work now, see this thread for official rules and how they want the submissions posted, each week there is at least one or two topics to write a short fan fiction story. Most of the writers have been utilizing the same character or a couple characters that they base their submissions on weekly. Below states the topics for this week. Xenobiology – Different species means more than different skin colors. It means different entirely different physiologies. Having friends whose bodies work so differently from your own can make things complicated, as everything from how you relax to how you dress and what your beauty rituals are (what is “lekku buffing”, anyway?). How do your characters deal with biologic differences that they encounter? Best Day Ever – We’ve written about our characters’ worst days; now write about their best days! A day when something wonderful happened, like finally beating your nemesis, or just a day when everything went really well for them, and how they reacted. Do you have a knack or, love for writing? Why not give this ongoing fan fiction contest a try? Seems like a great opportunity to get some feedback on your fan fiction writing…who knows the next Timothy Zahn or Drew Karpyshyn might just come from one of these writers. If you do make a submission please let us at Corellian Run Radio know, so we can check it out! How many of you have been busy attempting the new content on the Public Test Server that will be in Patch 1.5? 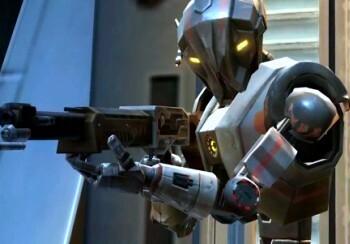 Hmm speaking of HK-51, has anyone noticed the patch for this companion to be released is 1.5, let’s reverse that, it is 5.1, now drop out the period and you have 51…coincidence or chance, I don’t think so. Very clever BioWare. While you are busy on PTS or getting your opposing faction character to “mid-level,” don’t forget to catch this week’s latest podcast and your favorite CRR weekly articles. As you read our writers’ articles and listen to the podcast, be sure to take a moment and submit your feedback and suggestions in the comment sections. We love to hear from you. Thanks and enjoy the links below. Yes, ladies and gentlemen it is getting to be that time of the year…time for the ghosts, goblins to all emerge and of course all the Jack-O-Lanterns to be carved. 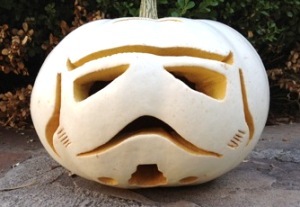 On StarWars.com there is a great do it yourself guide for making a Stormtrooper carved pumpkin by Jennifer Landa, to make all the neighbors jealous. It has been a long while since I have carved a pumpkin, but with these instructions and Stormtrooper design from ThinkGeek.com you will be able to do it. Now kids, be sure you have a parent or an adult help, since there is actual carving involved. Parents, if you do not wish to carve the pumpkin, you can always use the pattern and let the kids use markers, or paint to make the Star Wars Stormtrooper come to life! If you make a Stormtrooper pumpkin or any Star Wars themed pumpkin please submit your pics to our Facebook group page or send to our email at corellianrun@gmail.com. Speaking of servers events there are a few upcoming events this weekend and the next week or so. Below are also listed some reoccurring events you might want to find out more details and take part in. If you have a particular link, story, video, or topic related to SWTOR we would love to hear about it! You can send those us here at Corellian Run Radio and we can place it in a future article. Just email us the links and/or the details for the event at corellianrun@gmail.com, or you can also leave any link suggestions in the comments below, or in Corellian Run Radio’s Facebook group. Thanks and see you all next week!